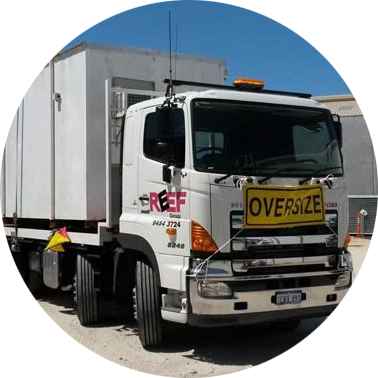 Reef Group provide a range of transport options in Perth for large equipment and machinery. Our fleet of heavy-duty load and transport vehicles includes two eight-wheeler, rear mount HIAB’s a 288 and 322 crane truck. It is equipped with an optional pig trailer that is ideal for delivering multiple loads. This truck is capable of lifting sea containers, dongas, power poles, street signs, generators and more. If you’re unsure of whether Hiab crane transport in Perth is right for you, give us a call. We’ll gladly advise you on the best transport options for your situation. We also now have a Palfinger 5600 prime mover crane truck towing a 12m semi-trailer for all your larger equipment. We’re able to offer a wide range of transport solutions. Our Rigid crane trucks is capable of lifting 6,300 kg at a height of 4 metres, and 1,940 kg at a height of 15 metres. With our Semi crane truck capable of lifting 11,000 kg at 4.4 meters and 2,600 kg at 15.8 meters. If you’re not certain whether you would be better served by a Hiab or one of the other vehicles in our fleet, feel free to contact us for advice. You can also download our ‘Transport Guide’ for vehicle specifications and to check load capacities. Check out our monster Hiab in action lifting a sea container! Our state of the art crane mounted truck is remote operated and capable of delivering to second and third floor locations. It can lift equipment over fences and past obstacles. And given the fact that there’s no need to supply a crane in addition to your transport vehicle, hiring a Hiab in Perth can save you money as well. Reef Group’s record speaks for itself. Our service model is a natural extension of our core values: safety, reliability and professionalism. It’s because of these values that we’ve grown from a small company running a single truck to a respected provider of complex transport solutions for the whole of Australia. We’re committed to safety at Reef Group, and this is evident in the high standards that we employ. To begin with, we’re WA Heavy Vehicle accredited (for main roads in WA). Furthermore, we only employ professional and courteous drivers who are suitably qualified for the work at hand. We ensure that all of the following are up to date – licensure, medical check-ups, fatigue management, elevated work platform certifications (EWPs), white cards, first aid training and MSIC. Our crane operator is licensed to operate a mobile slewing crane of up to 100 tonnes. And he also holds his EWP and forklift tickets. What Can We Offer and What Are Our Weight and Height Limits? We’re able to offer a wide range of transport solutions. Our crane truck is capable of lifting 6,300 kg at a height of 4 metres, and 1,940 kg at a height of 15 metres. If you’re not certain whether you would be better served by a Hiab or one of the other vehicles in our fleet, feel free to contact us for advice. You can also download our ‘Transport Guide’ for vehicle specifications and to check load capacities. The first hydraulic truck mounted crane was invented in 1947 in Sweden, and the word ‘Hiab’ is an abbreviation of the name of the company that manufactured it (Hydrauliska Industri AB). The invention was a major breakthrough in those days, as this was the first time that a truck-mounted crane could be easily moved from one place to another. Today, Hiab trucks are found all over the world, and they’re the most popular articulated truck crane found in Australia. At Reef Group, we value these trucks for their power and durability. We know from experience that they’re engineered to the highest specifications. They offer unmatched versatility and control, and that’s why we’re proud to provide a Hiab truck in Perth. Hiab truck mounted cranes are cost-effective, and they simplify what would otherwise be complicated loading and transport jobs. They are useful for a range of applications in the construction industry, as well as for handling heavy equipment and machinery. Contact Reef Group to learn more about how our Hiab truck services can be of assistance. 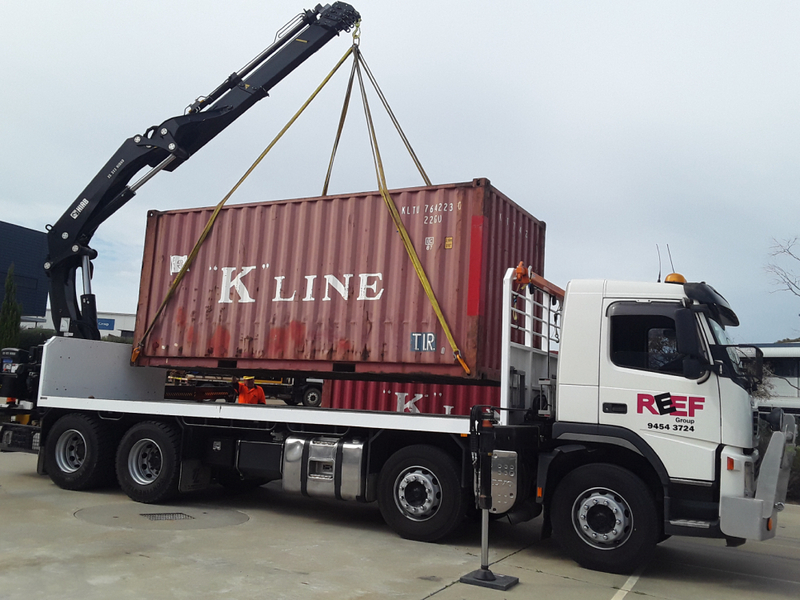 Reef Group offer Hiab transport in Perth within the Perth Metropolitan area, and we also regularly serve greater WA. 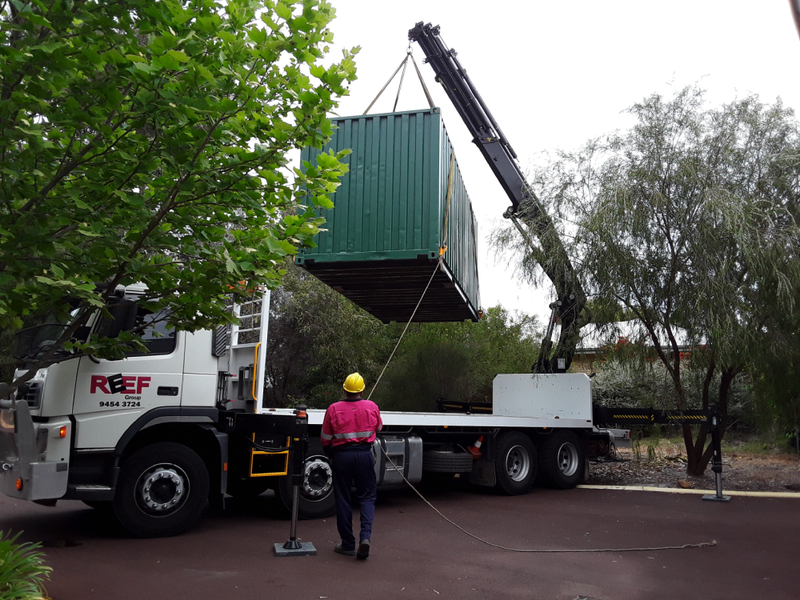 Our trucks routinely assist with the loading and transporting of oversized machinery and equipment in Geraldton, Bunbury, Busselton, Albany, Esperance, Port Hedland and beyond. Another shot of our Hiab in action. A sea container being dropped onto the back. We understand that as your business continues to grow and flourish, your transport needs are also going to grow in kind. Our services are scalable, and we keep a close eye on the needs of our clients to ensure that we’re always capable of meeting them. Our team has more than 40 years’ cumulative experience, and we’re standing by to simplify your transport considerations. Contact Reef Group today for more information or to request a quote.